I first discovered the Grand Canyon with my Dad. During my professional years, I travelled regularly to Las Vegas for the Comdex convention, which was, at the time, the largest gathering of computer geeks in the world. I liked to stay in Laughlin, NV, just to get out of the craziness of the Las Vegas Strip. One year I asked my Dad to come along, and he accepted. While I attended the conference, he stayed behind and played at the casino. Then we could have dinner together and do tourist things. The Grand Canyon is about 3 hours away from Laughlin, and since we’d arrived a day before the conference was to begin, we decided to take a day and drive to the canyon, spend a few hours, and drive back. I don’t think I’ll ever forget looking over that rim for the first time. Have you looked over the rim? Then you understand. If all you’ve seen is pictures, then you don’t. After my brain settled down a bit from that first look, I noticed an obvious trail some distance below our vantage point (it turned out to be the trail to Plateau Point.) “Someday I’m going to walk down there,” I told myself. 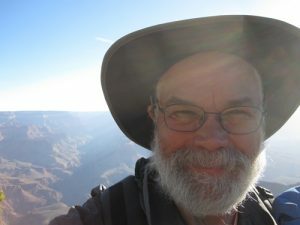 I was in my 40s, and had done some backpacking with the Boy Scouts, but had never taken a trip where I was responsible for all the aspects of the journey. 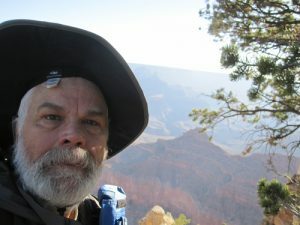 With my 40 year old brain, I thought it would be a good idea to do a backpacking trip in the canyon. I asked my Dad if he’d like to go too, and after thinking about it for a while, he said yes. Dad had been in the military, but had never been bitten by the camping bug. I talked to him about getting some good boots, loaned him a backpack, and suggested he put some weight in it, and do some hiking every day to get in shape. Dad never spent a nickel he didn’t have to. As we were corresponding about the upcoming hike, I asked him if he’d bought his boots. “Yes,” he said. I should have asked him to elaborate. He’d gotten a deal on some steel toed work boots. I’m not sure how well they fit him either. “Are you hiking with some weight in your pack?” “Yes,” he said. Again, I didn’t ask him to fill in the details. It turned out that the weight he was putting in his pack was a couple of coffee table sized books. Maybe 10 or 15 pounds. I had something more in mind like 50#, but he was my Dad and I didn’t push it. The big day finally arrived. He flew from Lansing and I from Houghton. We were to meet in Chicago and take the same flight to Las Vegas. We met up in Chicago with no troubles, and caught our plane to LV, where we picked up our rental car, and made our way to the canyon. I’d booked a room at the Yavapai Lodge in Grand Canyon Village for the night before our hike was to start. When we got there, we spread out all our gear and split things up into our respective backpacks, and set the alarm for early. The best hiking in the desert is early morning, so we got up very early, loaded up our packs, and drove to the rim. We parked the car near the trailhead of Bright Angel Trail, and started down. Dad did pretty well at first, although we were going a little slower than I would have liked. The Bright Angel Trail is 9 miles long, and our first night was to be at the bottom of the trail. By the time we got to the first rest house, which is 1 ½ miles down the trail, we’d spent over an hour hiking. Doing the math in my head told me if we kept up this pace, it would take us over 8 hours to get to the bottom, which is a very long day for a beginning hiker. After a 20 minute rest, we pushed on. Dad started complaining about his legs feeling numb as we continued down the switchbacks. Down is the hardest hiking in my experience, because of the jolts your legs get every time you take a step. There was another rest house called 3 Mile just down the trail, so I decided we’d make for that and see how things were going. I could not get Dad to understand how to drink water while hiking in the arid southwest. All his life his drinks had been in sips, and down in the canyon, you need to guzzle. He told me his mouth was getting dry, so we stopped in the shade and I handed him a liter of water and told him to drink it. He sipped and gave it back to me. I tried but could not get him to understand what I wanted him to do. He was getting dehydrated, but would not drink water. By now we were about 3 hours into the hike and had not made the 3 Mile rest house. I decided we needed to turn back. I hiked out with my backpack. I left him all the water we had except for what I needed, and all the powerbars. When I made it to the top, I dropped the backpack off in the car and turned around. I got back down to him a couple of hours after I’d left him, and he was in much better shape. He’d walked a short distance until he found a good place to rest, then had some water and a snack, and did it over again. He told me he’d asked a couple of guys that walked by if he could pay them to carry out his backpack, but he didn’t get any takers. I shouldered his pack and we hiked out without incident. We got a room for the night back at the Yavapai, and left the canyon the next day. Dad and I made one more trip to the canyon as tourists after that, but never tried another backpacking trip. He was in his 70s and just didn’t have the will for it. I understood. I made several trips into the canyon after our aborted trip together, and I count the times I spent below the rim among the best in my life. Fast forward to May of 2018. I’m staying in a hotel room in Tusayan, AZ. Dad passed away on April 4, 2018. It was such a busy time for me that I felt I had not grieved properly. Looking at the calendar, I say a hole in the second week in May. We had the frequent flyer miles, and I had the time, so I booked the trip. I’ve spent my days rim-hiking, which I’ve never done before. My knees preclude me from backpacking, but I can still rim hike, and hike I have done. There have been tears and smiles. I feel as though the cork has come out of a bottle and all the contents have shot out. I can not imagine a better place to say goodbye to a constant force in my life. Thank-you Howard Soldan for bringing me into this world, bringing me up, and sticking with me through my numerous foolish escapades. I miss you more than words can say, but at last, I feel as though I’ve said a proper goodbye. Picture 1 was taken shortly after I arrived at the canyon and had my first look. Notice that I have my hat on backwards. I was sad but happy, if that makes any sense. Picture 2 was taken on my last hike on my last day at the canyon. This entry was posted on Sunday, May 13th, 2018 at 9:16 pm and is filed under Uncategorized. You can follow any responses to this entry through the RSS 2.0 feed. You can leave a response, or trackback from your own site. Another powerful piece. Thanks for sharing such precious memories, Ted. Thanks Shalini! I think writing is therapeutic for me. Such a treasure you are… thanks for sharing your amazing lineage. RIP Howard. Thanks for the kind words Stella! What a memory to have of your father. Your grief will be with you for a long time to come, Ted. Thank you for sharing your Grand Canyon stories with us. Your memories are beautiful. Thank you for the constant friendship Marj. Friends are so important at times like this. thank you for sharing Ted! so glad you could make that trip out there again and reminisce about your dad!!! Thanks for the kind words Cathy. It was a good trip and it is great to be back in the Copper Country. Thank you for sharing, Ted.